← Monday Question – You Must Choose: By Kilian Or Parfumerie Générale? I have been working on this non-review on and off for almost a year now, and since I realized things are not changing at least for now, I decided to finally get it together and post it. Mitsouko is arguably the most important and best known perfume in the world of Perfumistas, in the real world I believe that spot goes to Chanel N°5. And – I’m speculating here of course – while we all revere and admire this iconic scent, many of us have their issues with actually wearing it. 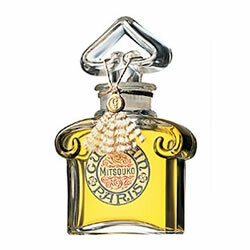 Created by Jacques Guerlain in 1919, Mitsouko includes notes of bergamot, lemon, mandarin, neroli, peach, rose, clove, ylang-ylang, cinnamon, oakmoss, labdanum, patchouli, benzoin and vetiver (according to osmoz.com). Bergamot, Peach, Jasmine, May Rose, Spices, Oak Moss, Vetiver, Wood is another notes list I found. Obviously Mitsouko has been reformulated, and not only once, in the long time since its inception. And unfortunately, I have no way to comment on that, my non-review pertains to the currently available Eau de Parfum version. So why do I insist on calling this a non-review? To protect myself, to be honest. Perfumes like Mitsouko not only have fans, but those fan(atic)s are often staunch ideologers who are not afraid to go to war if their icon is damaged in their eyes. I have tried and tried to like Mitsouko. Not only because it is considered a master piece by so many, but also because I know myself to change my mind over time, familiarity breeds love and many perfumes I abhorred are now among my favorites. Not so Mitsouko (at least for now). All I get is damp cellar and hot swamp. My nose is, for some reason yet to be determined, not able to smell the fabled peach, to smell any floralcy, nothing. All I get is the swamp. And I can’t find it in me to like the swamp. I almost see the stones flying at me from all directions, and isn’t that Luca Turin over there throwing his book at me? Well, all I can say (and very sad and dejectedly too) is that I am just not her type. Guerlain asks a clear question here, and I’m afraid I have to answer in the negative. This entry was posted in Chypre, Fragrance Reviews, Guerlain and tagged Chanel No. 5, Chypre, Fragrance, Guerlain, Guerlinade, Mitsouko, Perfume, Review. Bookmark the permalink. I have a great big smile on my face and laughed openly at your anti review. AWESOME!! Maybe you are just far too young for this scent, try it when you are 35, so in ten or fifteen years…. Very flattering, but at my grand old age I still don’t get it. Some perfumes are just not for me. I feel exactly the same about Mitsuoko, but I was ashamed to admit it. I am sorry, I am not her type either. I feel less quilty after reading your non-review. Thank you. Mitsuoko, Shalimar, L’Heure Bleue and Chanel No. 5 are keeping each other company in my “Maybe One Day I’ll Get it” collection. Hello Birgit,first time commenting here,have been lurking for a while,I enjoy your expressive writing very much-regarding Mitsouko,I have similar problems,but since finding Roja Dove’s Diaghilev and falling in love with it,I feel I’m on my way to ‘getting it’,slowly,one step at a time. I’m taking the same route, or at least I’m trying. Since I love many Roja Dove perfumes, I tried Diaghilev as well – hmm, let’s just say for now we are not on the best of terms, but I have not given up and it is definitely better for me than Mitsouko. I am not a huge fan either I’m afraid (but I do adore my Shalimar so I can still stay in the perfume club right?!? ), but amusingly it is the peach note that puts me off. When you dislike a note it is usually the one note that always stands out and in Mitsouko’s case it’s the peach; I would love to get some hot swamp! The elusive peach… it is interesting how our nose and brains fixates on a note when we don’t like it much. Although it makes me sad that so many people evoke the fabled Grandmother in association with Mitsouko, I can see why that is. Well, there are so many Guerlains, old and new that I love, so in the end all is well. all formulations but rarely wear it. I think maybe it smells more than a little staid and no one wants to come across as matronly! I hope to experience the vintage version one day (if I can get hold of it for not too much money). It may be an important perfume but I somehow doubt there are too many fanatics out there. I think most of us have a classic Guerlain that we wish we could love – mine being L’Heure Bleue – but that’s just the way it goes. Which of the three current formulations is your favorite? I guess I would go for the edt or edp because they are fresher smelling than the parfum (which I can most see as “hot swamp” lol) and therefore come across as a bit more “youthful”. The whole question of ‘greatness’ is interesting. Citizen Kane is widely considered to be the greatest movie of all time… but how many people do you know who actually enjoy watching it? I think in the case of Mitsouko, ‘greatness’ is very closely related to context: would the scent had been considered as important as it is if it had been made 10 or 20 years later? Probably not. Of course every perfume, every work of art must be seen in its context, it cannot be removed from cultural and social influences of its time. 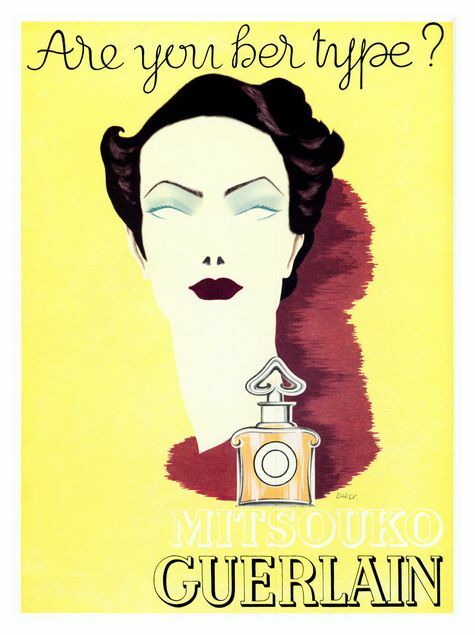 But some perfumes stand the test of time and continue to be relevant, and I’m sure we agree Mitsouko is one of those. oh I love that movie, and I do love Mitsouko, but as you all know I still don’t get L’Heure Bleue or Chanel No. 5! You’re not alone! I’ve tried Lady Mitsouko in as many versions as I could get my hands on. And all I get is…um…cough, cough….cat urine. Generally, I’m not a chypre fan, unless it’s light with a considerable amt of bright floral notes. My example being Lauder’s PC Jasmine White Moss. I appreciate your honesty, and stand next to you as a perfumista who can’t get along with the fickle lady. The iconic No. 5, however…. We’re besties! No5 is so much more wearable, I love the extrait the most. I used to think Mitsouko smelled musty. That bottle changed my perfume life, seriously! I’ve become an “old” Mitsouko addict. So much so, that as I panic of running out of my edt, I’ve been searching for modern replacements. At present, I found one candidate, which is alas very very expensive. Outrageously so, if you compare it to the price of Mitsouko edt!!!! My favorite perfumes (and friends, and men!) have never been love at first sniff/sight…. If you don’t like Mitsy, you won’t like my candidate either: “The party in manhattan”. TPIM is a bit more ambery thank Mitsouko, and less subtle, but the peach smell as if drenched in fine liquors, and there’s a hint of honey in the base… I love it, it’s like Mitsouko in furs, under the snow and laughing. I still prefer my bottle of oldish Mitsouko: it has a creamy note in the heart that is absent in the modern formulation and in “the party in manhattan”. I love “creamy”: that’s why tuberose perfumes drive me crazy with joy, I guess. Oh I love TPIM! I don’t smell the peach in that, but it has a wonderful rich base. I am so glad I found a fan! Nobody talks about it – there are hardly any reviews on the internet! To me TPIM is such a huge, ripe, boozy peach: à la james and the giant peach land in a pub! But I usually am a fruit-o-phobe in perfumes, maybe I am over sensitive to fruity notes? It’s OK that you don’t like Mitsouko. I don’t like Shalimar, L’Heure Bleue, Chanel No. 5 or Parfum de Terese. In fact, I think the only Guerlain’s I really love are Mitsouko, Vol de Nuit and Jicky, to a lesser extent. I can only wear Mitsouko when the weather is cooler and foggier. I keep trying scents from L’Art et la Matiere line, but nothing seems to work for me. I’d pay dearly to have full bottles of vintage Mitsouko EdP and Vol de Nuit, or at least in the older packaging like the perfumes you recently acquired. I keep hoping I’m lucky enough to stumble upon something in Paris next month. Sometimes I think it’s all body chemistry and not just skin chemistry. Genetically, we are supposed to be attracted to people who have a different genome than ours. Something about creating diversity. How are bodies smell is supposed to be a part of it. My daughter the BioC major can explain it better than I can. So it makes sense that we would all like some aromas/scents better than others. That is a very interesting concept, thank you, Tatiana. I hope you find your bottle of pre-reformulation Mitsouko in Paris! It makes absolute sense from an evolutionary point of view. seeing as I grew up in Atlanta, Georgia. Atlanta – the world of Peaches and Coke. My wife gifted me Mitsouko and now the bottle is 1/3 gone. It reminds me of my chilhood, peaches – I smell it!!! female fragrance – but I am asked constantly what I am wearing, and I proudly say “Mitsouko”. I’m so glad I could be of help at the beginning of your Guerlain journey, Charles! It is great that you discovered and fell for Mitsouko. So far I have been unable to like: Jicky, L’Heure Blue, Shalimar, or Nahema. I found Chamade, Apres l’Ondee and Mitsouko ok but dull. I’m afraid Guerlain doesn’t get a lot of love from me. Im not a Jicky fan either. Ive also tried a number of other Guerlain scents ,i.e. Spritulese Double vanille, Tonka Imperiale with little success. They were all blah to me. Maybe Mitsouko will be different. Well I hope so, Birgit, but you never know! I want to try both versions, edt and edp. I’ve heard great things about them both. i saw them both on sale at an online store for a great price. More samples to add to my list though. I thought I would love Mitsouko — it sounds like it should be my kind of thing — but I didn’t care for it at all. I should retry it at some point, though, as it’s been a few years. A friend very kindly sent me a sample of Roja Dove Dhiaghilev last summer and that, too, was instant dislike. As much as I love chypres, I find both of these fragrances suffocatingly thick. They don’t even quite seem like chypres to me for that reason. Thick is a very good word for it. Impenetrable and musty. Well, I am definitely in great company though! I did not care for any of the iterations of Mitsouko when I first tried them. Admittedly this was in the first bloom of my perfume addiction, a couple of years back, and perhaps I should try again. I remember scrubbing as soon as I possibly could. I don’t like original Shalimar either but love Initial and Ode a La Vanille. Perhaps the time is right for Mitsouko – Ode a la Peche or another type of flanker. Ode a la Peche sounds great! Genius idea! I wonder what would happen if they tried to modernize Mitsouko – would it be utter heresy or a great (and needed) facelift? “That’s find, more for me”. Let me know if you want to sell a bottle of Mitsouko. Hi Anita, those are just thoughts and I highly doubt they are influential to the powers that be at Guerlain. I don’t have a bottle of Mitsouko to sell, but if anyone reading this does, I would love to facilitate the two of you getting into contact. Any potential Mitsouko sellers, please contact me and I’ll pass your offer on to anitathepianist. I have a vintage bottle of L’Interdit extrait I could part with, if you’re interested. Yup, that’s what I smell too. Which is a pity, because I’d LIKE to smell it right. Me too! I want to get it, otherwise I’d just move on, but it fascinates me. I am not her type. But once in a great while if I am in a certain mood, I will wear her like a disguise. That sounds wonderfully poetic, Amy. I have written that down. Thank you. I don’t think that there’s a Guerlain classic that I don’t get, just some that get less wear than others. But the diversity of scent experiences is just great, I mean, I love Shalimar, especially on others, but can only wear it very seldom myself- love Ode a la V, Legere and SI though. You can’t wear Shalimar? Get out of here! 😉 I’m, like you, endlessly fascinated with Guerlain, and maybe I just haven’t found the right time for Mitsouko yet. But how do you feel about chypres in general? I think it all comes down to: do you gravitate to salt and sweat, or sugar and flowers? If it’s the first, then you’re a chypre/ leather wearer, and if it’s the second, then you’re the oriental/ floral enthusiast. Oh that’s such an interesting comment! Count me in the salt and sweat camp. I don’t dislike orientals and florals necessarily, but my natural home is chypres and I’ve never found them difficult. As for Mitsouko, that is a like without being a love. Wearing it is like walking around all day wearing the burden of history. Rochas Femme, now, that is for me much easier to wear. But I love some leathers and I do love some chypres, but they are usually less dense or thick then what I perceive in Mitsouko. Interesting perspective. Salt/sweat vs. sugar/flowers. I think I staddle the fence, liking fragrances from both sides. I’m definitely not the current Mitsouko type. I tried the version from year 1919 on a blotter and it is different. But if I’m her type I don’t even wanna know, because I’m never gonna get this one. Ha! Just a little advice. Try the extrait. I don’t know vintage Mitsouko, but what I know for sure is that Mitsouko in pure parfum it’s WAY better of the EdP formulation. I may have the chance to try the vintage extrait soon, a friend acquired some and is so generous to share it. It won’t let us go… Interesting how we Perfumistas always go back and try it again. I’m glad you tried other chypres, it is a wonderful genre. Hi! I’m so glad you wrote this. I can’t make myself enjoy Mitsouko, either. Ironically, I bought it for myself when I was 26 partly because I liked the Japanese reference and partly because I’d read Madonna wore it (I repeat, I was 26!!). A colleague commented on it saying it was an unusual scent for a young woman. It dawned on me that I didn’t actually like it, and still don’t 12 years later. Where is the peach?! I get funky dust. I was around that age too when I first tried it and was horrified. Funky dust actually captures it quite well, although I hope to be able to smell something else eventually. Another “austere swampy” vote here, but I have smelt this on my friend Clare, and it is peachy on her, in every sense! The only stones I’m throwing are the ones directed squarely at ol’ Mitzy. If only she smelled as good as “damp cellar and hot swamp”. Ha ! :o) … This little “non-review” has pleased me no end. It’s also all the more convinced me of our ever more probable “scent-twindon”. No matter how much I try I just can’t get passed the “rancid-spiced-peanut-oil-on-sizzling-wok” which she inevitably turns to on my skin – then hangs on the back of my throat. 😦 No other Guerlain pleases me less ! I dislike it so that it’s high “stature & luv” literally confounds me quite frankly. (If LT’s Diaghilev is indeed closer to the vintage (?? ), then yes perhaps then I might’ve understood and even concurred with all the “lurv”. But the way it stands, not if it was the last frag on earth …. What? I love Mitsouko. I’m 25. I have the parfum. The peach is strong in it, and the effect is dusty and dry like a barrel of Pompeii wine. As I said, it has nothing to do with age, on some Mitsouko is just perfect, on some it is a disaster, but it surely has nothing to do with age. What a nice and refreshing post, B! I’ve come to a realization recently that I’m not Jean Patou Joy’s type. Oh well… I’m happy to admire it on someone else. Some things just don’t seem to work, and that is fine. I don’t have like every important painting or book, but can still appreciate its artistry. This is the only feminine Guerlain I have tried that I do not like. I love Shalimar and Jicky, but Mitsouko and I just don’t get along well. I’m not too sad because Jicky brings to mind a lady I used to be fond of, but not anymore, who wore it. I have the same problem with Mitsouko as you..no peaches in there for me. Instead, a thick, boring doughy layer behind which I can barely guess a discrete, delicate scent. After a few hours the doughy aroma is almost gone and I finally get what makes people talk about (I suppose) . Sometimes, in cold humid days, she seems to show some respect and reveals some of her peaches but still, we’re not friends at all. Just yesterday I checked for the first time Vol de Nuit, I find it intriguing. Did I smell leather, tobacco or burned wood, and some chocolate, or just vanilla maybe? It vanished rather quickly and left me wishing for some more…but I only tried it once, in edt, and – my mistake- wearing on the other wrist Nahema (which btw I totally dislike), during a hot summer day. So I’ll have to revisit. The only Guerlain classic I liked at first sniff is L’Heure Bleue. I was very skeptic about it but when I tried it, I instantly forgot everything was said and write upon the subject, forgot it’s 100 year old, to me it’s calm, tranquility and cherries in a little bottle, my secret adiction. I only wish I could wear it every day, all day long. we seem to be on the same wavelength. I feel the same about L’Heure Bleue and Vol de Nuit is gorgeous, although I recommend the extrait to really get the full spectrum of this perfume. Hi there, it’s ok if Mitzi is not for you. She is as fickle as a cat and you must love the swamp smell to get her. I love cats and I’m from Lousiana, so maybe this is why she loves me. Perfume is such a personal thing that it would be ridiculous to assume that everyone will enjoy even the best fragrances. There are a few out there that I personally can’t stand, but appreciate for their artistic value (sorry Shalimar, I just hate orris so much, it’s not my fault). A reviewer on another site who didn’t like Mitsouko described it unflatteringly as ‘smelling like a zoo’. When I wore this during my zoo work experience, the animals liked it (especially the cats) so maybe they weren’t completely wrong. It does make me think of the wilderness and rainy woods. thanks for your comment. I’m fine with not liking Mitzy by now, you are right, we can’t all love the same things.